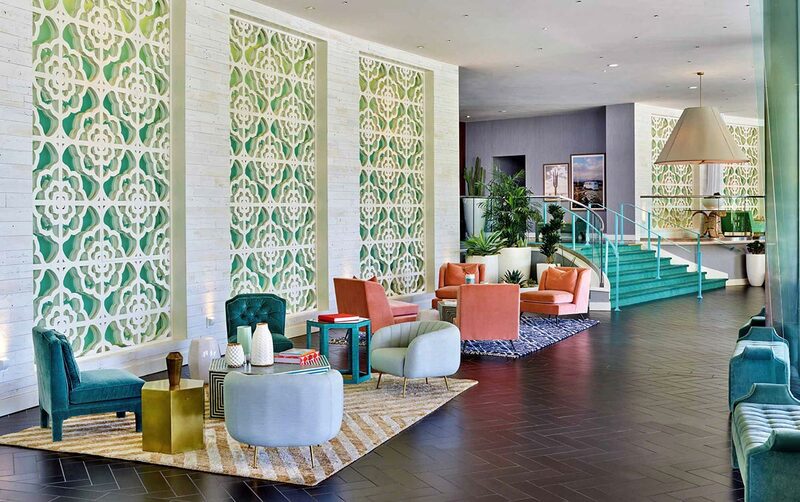 Dating back to the 1960s, The Riviera is one of Palm Springs’ most storied hotels, having most recently boasted a 1970’s glam aesthetic and a history of glamorous guests from Frank Sinatra and the Rat Pack to Marylin Monroe. Rose Ink Workshop reimagined the space to jive with contemporary Palm Springs, creating a bohemian getaway that was stylish, eclectic, and cool. Inspired by the easy glamour of Slim Aaron’s photographs, the new design emphasizes mid-century styles & vibrant playful colors with a just sprinkling of retro nostalgia. We wanted to modernize the interiors, yet keep a bit of whimsy in the public areas to tie the hotel’s past and present together.